If you are building or upgrading a gaming PC, there aren’t many graphics cards better than the EVGA GeForce RTX 2080 Ti FTW3 Ultra Gaming Graphics Card to choose from. Retailing at $1500 this GPU can handle practically any game on the highest graphics settings. 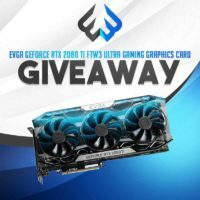 If you want to win this great graphics card for your gaming PC, simply enter this free international giveaway for a chance.